Greetings from Denver airport! I’m on my way home after a short, but sweet trip to Chicago. I was there for a personal business (<- more on this later…), which only took 10 minutes of my time . The rest of the trip was up to me, so I did some shopping and visited with a good friend, who owns this awesome Trendy Nails salon. Yesterday, she spoiled me with full mani/pedi and delicious Mediterranean lunch at Olive Mediterranean Grill. If you’re in Evanston, IL area, I highly recommend checking out these two places. The nail salon is super clean and luxurious with talented and friendly staff. And steak shawarma at Olive is just to die for, so tender, juicy and delicious! Well, being up since 2:45am this morning and even after 2 cups of coffee, I still feel quite dizzy. So I will keep this post pretty short. It took me couple trials to perfect the recipe. First, I tried just three main s’mores ingredients, chocolate, marshmallows and graham crackers. Unfortunately, the truffles turned out too hard and super chewy. Not good, unless you’re into jaw workout. So instead of just melted chocolate, I switched to chocolate ganache. Bingo! A splash of cream kept the truffles nice and soft. 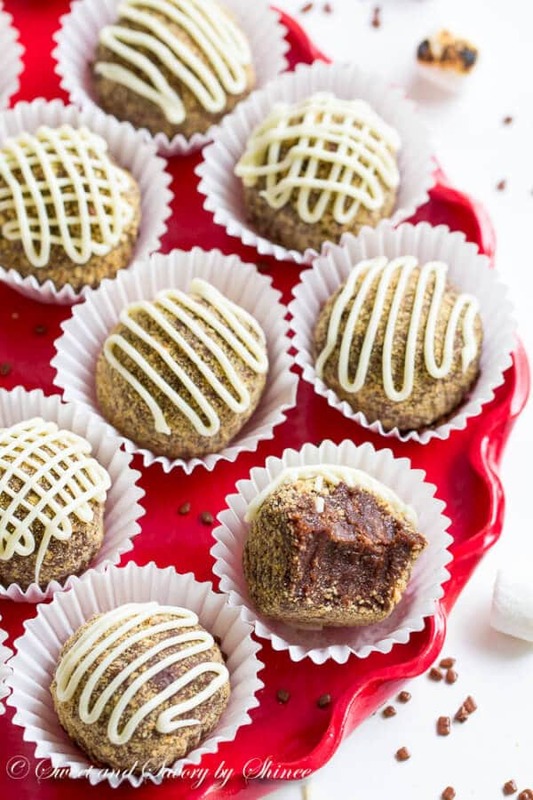 These truffles are almost cross between fudge and truffles. Soft and smooth like truffles, yet rich and chocolate-y like fudge. Delicious! And that drizzle of white chocolate is totally optional. I dressed them up with white chocolate for pictures. Besides, they look totally holiday-worthy this way, yes? 1. In the food processor, pulse the graham crackers until fine crumbs. Alternatively, you can place the graham crackers in the ziplock bag and crush them with rolling pin until fine crumbs. Reserve 1/3 cup of crumbs. 2. In the double boiler over simmering water, combine semi-sweet chocolate and heavy cream and stir until the chocolate is melted and the mixture is smooth. 3. Line a baking sheet with a foil and spray cooking spray all over. Spread the mini marshmallows on the sheet and broil for 2-3 minutes, or until they are slightly browned and puffed a bit. Keep a close eye on them, it will take just seconds from perfect to burnt. 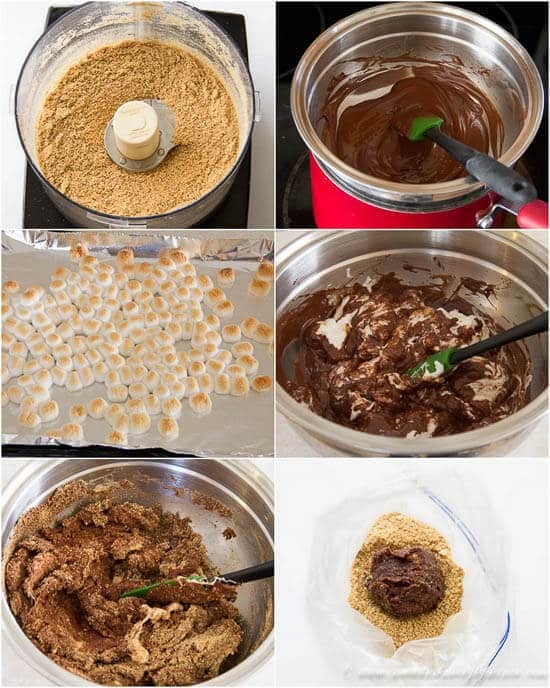 Transfer the roasted marshmallows into the bowl with melted chocolate mixture. Stir in the graham cracker crumbs. Mix until well combined. Cover the mixture with a plastic wrap and let it cool and set for about 30-60 minutes. You may put in the fridge to expedite the process. 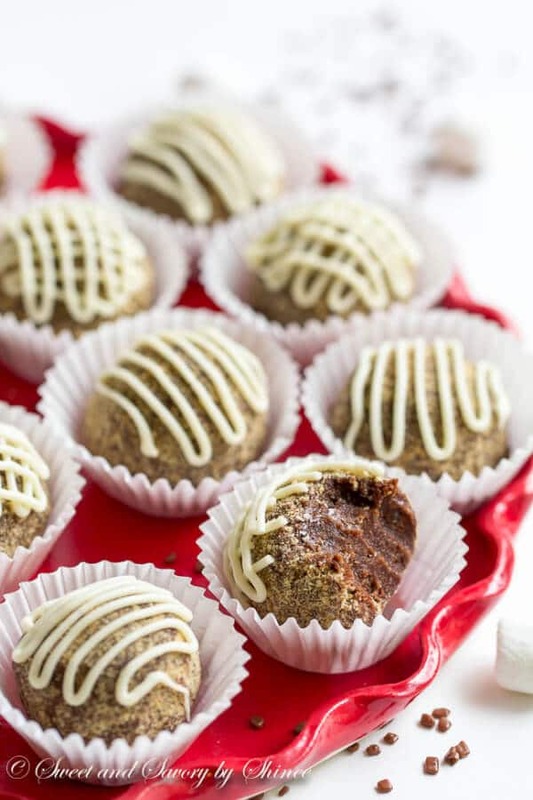 Once the mixture is set, form the mixture into 1.5-inch truffles using a cookie scoop. 4. 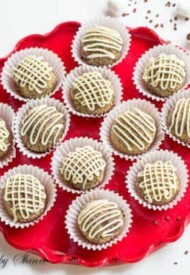 Place the reserved 1/3 cup of graham cracker crumbs in a ziplock bag and roll each truffle in the crumb. 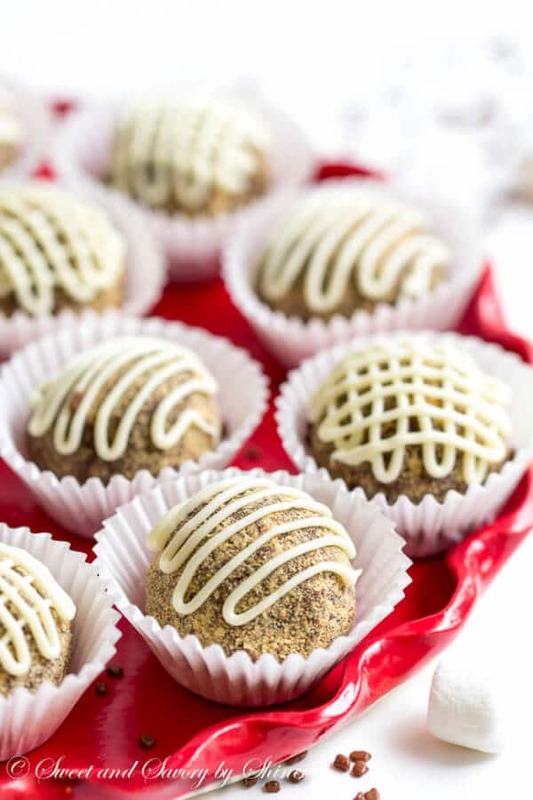 Arrange the truffles on a platter. 5. If desired, melt the white chocolate in the microwave according to the instructions on the packaging. Put the melted chocolate in a ziplock bag with a small hole cut out in one corner. Drizzle over the truffles to decorate. Keep refrigerated until ready to serve.